In this masterclass, Joan invites you to take inspiration from the colours of Summer to create a tapestry. On the first day, the class will take a walk around Newburgh to explore the surroundings and gather inspiration through colour notes, photography, sketches and any other methods of recording. You might be drawn to the ripening fields and trees in full leaf, town gardens brimming with fruit and flowers, or the summer skies reflected on the waters of the Tay estuary. Back in the studio, students will work at their own pace, on colour samples and designs for small tapestries. Joan will share examples of her work with the class to illustrate how specific effects can be achieved, and will lead discussions and offer technical demonstrations on colour matching and blending. She will also work with each student on a one-to-one basis to solve problems as they arise during the workshop, and to offer guidance to help you develop your practice. 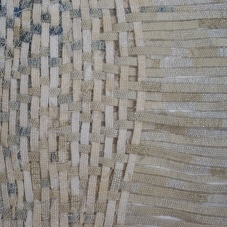 This class is suitable for those who wish to use traditional tapestry techniques, as well as those wishing to adopt a more experimental approach. Joan will bring a full palette of weaversbazaar yarns for use in the workshop. This class is suitable for all except for complete beginners. 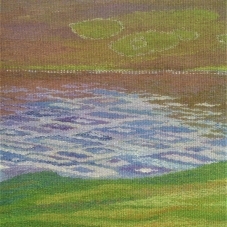 Joan Baxter is a tapestry weaver based in the far north of Scotland. After studying tapestry at Edinburgh College of Art and Warsaw Academy of Fine Arts during the 1970s, she spent eight years working as a weaver and trainer in commercial tapestry studios in the UK and Australia, notably working on the Henry Moore tapestries at West Dean Tapestry Studio. 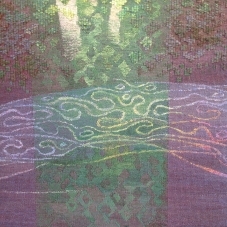 Joan has been an independent tapestry artist since 1987, working to commission and exhibiting widely. She has had solo exhibitions in the UK and Denmark and participated in many group exhibitions around the world. Alongside the narrative style that she is known for, Joan also experiments with pieces that push the boundaries of traditional tapestry. She is committed to raising awareness of tapestry weaving and passing on her skills.